LANCASTER, England (CNS) — A huge plume of grey smoke billows into a vivid blue sky as rooftops and buildings buckle into twisted iron and debris and then begin to fall. Beneath the smoke, human wreckage of the blast is visible: faces of victims contorted in pain and others dead, lying in pools of their own blood. 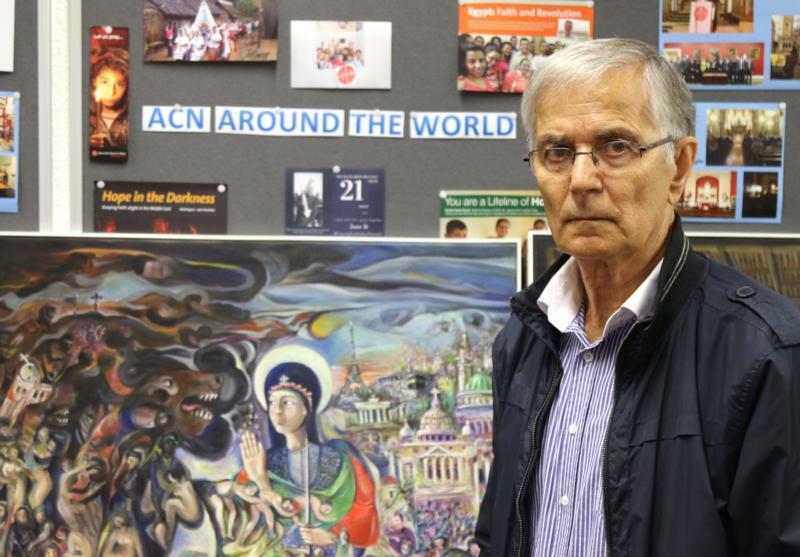 They are the creations of Farid Georges, a Syriac Christian from Homs, Syria, who has depicted the six-year war in his native country in about two dozen paintings. In a late-June interview with Catholic News Service in Lancaster, Georges, 70, a professional artist, recalled how in 2013 he personally witnessed the explosion that he would later capture in oil on canvas. “This was particularly painful to paint,” he said. “I saw the smoke rising and knew there was an explosion, and when I eventually went to the scene I was confronted with the scale of the damage, the destruction, and the sheer number of casualties, people who had perished of all different ages,” Georges said. He added that to this day he does not know the source of the attack. Homs was a city on the front line of the war and, as fighting engulfed residential areas, Georges and his family stopped sleeping in the bedrooms because they were exposed to gunfire and shell blast, choosing instead to spend their nights downstairs in the sitting rooms. Eventually, they fled into the countryside and spent a year there before finally leaving Syria for the safety of other countries. Georges said he knew “many, many people” who died in Homs. They included Father Frans van der Lugt, 75, a Dutch Jesuit shot in the head in 2014 by assassins after he refused to abandon the poor and homeless of the city. Georges painted a montage of 16 images in tribute to Father van der Lugt, and it now hangs in his home in Nuremberg, Germany, where he has lived since 2015. The painting forms part of the English exhibition arranged by Aid to the Church in Need, an international charity set up to help persecuted Christians. Georges said he was “very shocked and saddened” by the priest’s murder. “I knew him very well, we had a very close relationship,” he said. The paintings in the exhibition were created between 2012 and 2014 and, together, they work like a narrative. An early one, called the “Flower of Homs,” shows the Syrian city at peace before the violence, for instance. As the paintings progress to the horror of the war, the images darken, and dismembered bodies fill the canvas as people and their dwellings are destroyed. 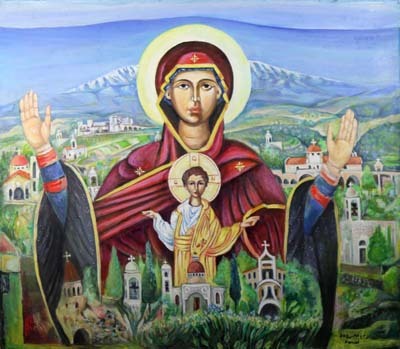 “Forgiveness in Ma’aloula,” one of the later paintings in the exhibition, points beyond the war to the hope of Syrian Christians for final peace and reconciliation. It depicts an enormous figure of Christ standing astride two hills representing the ancient Syrian village where Aramaic, the language of Jesus, was still spoken. The hills form faces staring at each other. “I wish and hope that it will return to the diverse mosaic of peaceful coexistence that we have,” he said. “We have more than 20 sects of different confession in Syria. We have always lived in peace and coexistence. “All we need is for us to be left to our own devices,” he added.